Understanding Lumber Pricing: How Lumber Order Size & Destination Affects Pricing. As we continue to (hopefully) take some of the mystery out of lumber pricing, we’ve discussed quality and size as well as origin. 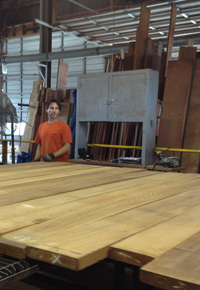 Two more major factors in the price we give you relate to your particular order size and the lumber’s final destination. J. Gibson McIlvain offers nationwide shipping throughout the continental 48 states as well as to Alaska, Hawaii, Canada and the Carribean Islands. Since we operate our own trucks, we incorporate the cost of shipping into our overhead costs, so it’s reflected in the price we quote you for your lumber order. If you’re getting quotes from different suppliers, you’ll want to be certain to ask about shipping costs. If you’re quoted a price that’s significantly lower than ours, chances are that they haven’t included the additional shipping fee, which could be quite hefty — particularly if they utilize common carrier shipping. Such an arrangement can also lead to concerns over the condition the lumber will be in by the time it arrives at your jobsite. 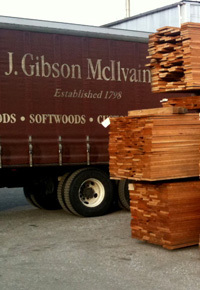 Here at J. Gibson McIlvain, we have our own fleet of lumber delivery trucks. Our drivers are well-trained in handling lumber and unloading it at various types of job sites, and if one of our trucks is delivering your order, their expert assistance is included in the price we quote you. They will make sure that what you receive at your job site is in the same top condition in which we sent it out. 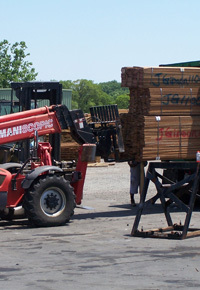 While we literally sell lumber by individual boards to those who stop by our lumber outlet in Connecticut, we typically offer “wholesale” prices to builders and contractors who are purchasing large amounts of lumber. When it comes to lumber, it really is true that “the more you buy, the more you save.” Why? Overhead expenses are about the same — or more — for a small order (say 100 board feet) as a large order (say 1000 board feet). From forklift use to paperwork, they run about the same, and that cost is spread out over the order, making a board in a 100-foot order essentially cost more than an identical board that’s part of a 1000-foot order. In addition to the already higher per-board cost of a smaller order, consider the fact that a smaller order will probably require packs being broken up. If we happen to have a broken pack already available to use for your 100-board order, it’s probably behind several full packs ready and waiting to go out for large wholesale orders; moving those packs will require extra time, effort, and equipment use, and all that gets factored into the price we quote you. Hopefully, you now feel like you have a better understanding of how lumber pricing works, and you realize that it depends on several complex factors. We hope you at least understand why we can’t simply post price lists like your favorite restaurant and that you now realize some of the major factors that influence lumber pricing. If you have any further questions, please don’t hesitate to contact one of our sales representatives who will be glad to assist you. Call us at (800) 638-9100.